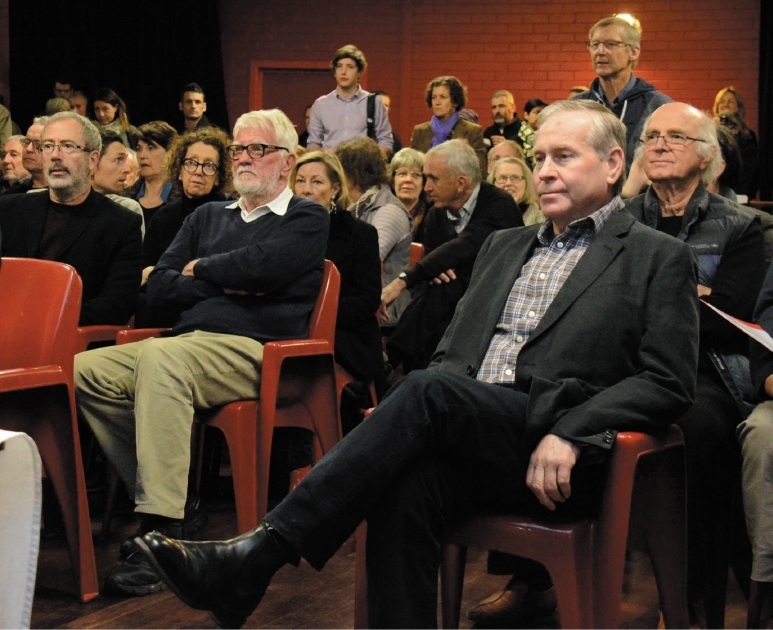 Premier Colin Barnett at last week’s North Fremantle Community Association Meeting. The State Government is also no closer to finding a solution to extend the PFL from Stirling Bridge into Fremantle Port. But any hope these challenges would sway the State into working instead towards an outer harbour at Cockburn Sound have been stopped in their tracks, with Premier Colin Barnett warning that environmental groups are sure to perk up once the dock is put firmly on the agenda. Mr Barnett last week reiterated comments from State Treasurer Mike Nahan that Roe 8, the 5.2km link from Roe Highway to Stock Road, was good to go. �I expect the contracts for construction of Roe 8 to be signed well before Christmas and I expect construction to begin early 2016,� he said. But residents in Hamilton Hill, Palmyra and White Gum Valley, who are situated along two alternative routes linking Stock Road to Stirling Bridge, are still no wiser about their future. �That connection is still a long, long way away and very different to the Roe 8 issue,� Mr Barnett told a packed North Fremantle Community Hall last Tuesday evening. The Government is also battling to find a solution for the last piece of the Perth Freight Link puzzle: getting trucks across the Swan River. Sustainability expert Peter Newman said a solution �looks almost impossible�. �It�s quite possible the only thing is to go over the top of the Stirling Bridge,� he said. �It seems to be the only thing the engineers are saying to me. But the issues have not encouraged Mr Barnett to turn his attention to the outer harbour at Cockburn Sound, which he said would come under intense scrutiny when planning finally got started. �There is no doubt at some stage you will see the development of a container facility in Cockburn Sound,� Mr Barnett said. �But that is going to be a contentious project; it will be heavily opposed, probably quite validly on environmental grounds, on recreational grounds for people who sail and boat and fish in the area. Prof Newman said any PFL should be headed to an outer harbour because of WA�s growing �knowledge economy� and because container terminals should not be in the heart of a city, as is the case in Fremantle. Mr Barnett said he would rather progress Roe 8 now than wait 10 years for an over-flow outer harbour to be built.